Some Words from the Champion! 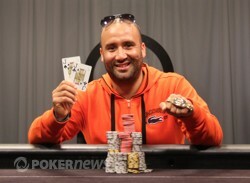 Imed Ben Mahmoud Wins Event #1: €2,700 Six-Handed No-Limit Hold'em (€147,099)! The first event at the 2012 World Series of Poker Europe is in the books. Emerging victorious over the 227-player field was Imed Ben Mahmoud to earn a payday of nearly €150,000 and his first-ever WSOP gold bracelet! 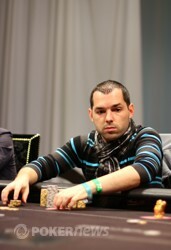 Mahmoud began Day 3 sixth in chips out of the final eight players. He maneuvered his way to heads-up play with start-of-the-day chip leader Yannick Bonnet, but was slightly behind in chips. Right away, though, Mahmoud snatched the chip lead and never looked back from there. When the final hand came up, Mahmoud four-bet all in with the and Bonnet put himself at risk with the . The board ran out and it was all over. For his finish in second place, Bonnet earned himself over €90,000. By winning this bracelet, Mahmoud has become the first-ever gold bracelet winner from the country of Tunisia — the smallest country in North Africa. He surely did his country proud and will be wearing a giant smile on his face for the rest of the foreseeable future. With the first event in the books, things are just getting started here in Cannes. Event #2: €1,100 No-Limit Hold'em is moving forward and Event #3: €5,300 Pot-Limit Omaha will begin tomorrow. Be sure to stay tuned to PokerNews all series long for all of the coverage. On the button, Imed Ben Mahmoud raised to 62,000. Yannick Bonnet reraised from the big blind to 150,000. Mahmoud reraised all in, having Bonnet covered. With a total stack of 735,000, Bonnet called and the cards were on their backs. Bonnet turned over the for two overcards against the for Mahmoud. With less chips, Bonnet was the player at risk and looking to double up. If not, the first gold bracelet of the 2012 World Series of Poker Europe was going to be wrapped around Mahmoud's wrist. The flop came out and you could see the body of Mahmoud tense up a little more as he anxiously awaited two more cards to come. The turn brought the and that meant the victory was just one card away for Mahmoud. The dealer burned one more time and slapped the on the river, awarding the hand and the tournament to Mahmoud. He erupted from his chair in excitement as he had captured the title here in the first event. For his runner-up finish, Bonnet earned €90,884. 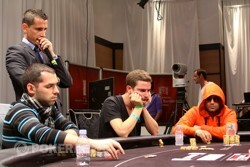 Yannick Bonnet raised to 62,000 on the button and Imed Ben Mahmoud reraised to 175,000 from the big blind. Bonnet folded and Mahmoud won the pot. Yannick Bonnet raised to 50,000 on the button and Imed Ben Mahmoud called from the big blind. The flop came down and Mahmoud check-called a bet of 30,000 from Bonnet. The turn was the and both players checked. The river was the and Mahmoud led for 75,000. Bonnet folded and Mahmoud took the chip lead. The two players have returned and the cards are in the air for the heads-up match. The two remaining players are on a short break. Here are the official heads-up chip counts. Matan Krakow's amazing two-year run has come to an end. After finishing in fourth place last year in this event, Krakow was just eliminated in third place this time around, making for an amazing back-to-back run. Krakow was all in for his last 50,000 or so with the and up against the for Yannick Bonnet. The flop, turn and river ran out and Bonnet's pair of threes earned him the win. Krakow took home €63,671 for his effort.